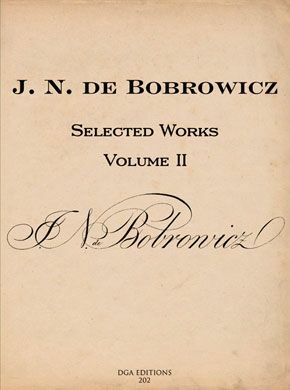 Jan Nepomucen de Bobrowicz (1805-1881) was a student of Mauro Giuliani and a composer of much ingenuity. The 10 works presented in this volume represent the majority of the remaining known published works. His arrangements for voice and guitar are not included. Polish musicologist and guitarist. His main areas of interest are guitar music of Classical-Romantic period and theory of musical form. He studied guitar with Ireneusz Strachocki, Krzysztof Panuciak and Roberto Porroni. Performs in chamber ensembles. He writes extensively on music by such composers as Jan Nepomucen Bobrowicz, Mauro Giuliani, Fryderyk Chopin, Robert Schumann, Franz Liszt and others. Developed a theory of Sonata Form (expressed in Ph.D dissertation "Sonata Form and Sonata Cycle in Guitar Music 1780-1830; Warsaw University 2001; in Polish).